The Lightfoot Air Machine: 18?? The Linde Cold Air Machines: 188? Refrigeration may not be a glamourous area of technology but it is of vital economic importance. On the large scale it means frozen food can be transported around the world; on the small scale it means we don't have to go shopping for perishable food every other day. The well-known refrigerating agents today are ammonia, for commercial operations, hydro-flurocarbon compounds (HFCs), hydrocarbons such as butane and pentane, and air and water. In case you are wondering about the last two, air is used as a refrigerant in air-conditioning machines for aircraft, fed by bleed air from the jet engines. Water is used as a refrigerant in static air-conditioning systems. Ammonia is known to be dangerous. It is poisonous and explosive in air in some proportions. You might think that by this time the dangers of ammonia had been completely conquered, but you would be wrong. This accident in August 2013 in China killed 15 people and injured 26. HFCs are used because they do not contain chlorine and so do not affect the ozone layer. A release into a confined space can cause asphxiation, as is true of any gases except air and oxygen. Any sort of inflammable refrigerant presents a risk of explosion. There have been recent reports of domestic butane refrigerators exploding due to leaks. All the dumped refigerators that I've seen recently have had 'Pentane' written on the back. Pentane has a flash point of -49 degC and ignites easily. Pentane is apparently being replaced by propane in this application. Are many in number, including CFCs, sulphur dioxide, carbon dioxide, ethyl chloride, methyl chloride, methyl formate. Ethane (C2H6), propane (C3H8), butane (C4H10), iso-butane ((CH3)3-CH), methyl-ether (by Tellier) and diethyl-ether () have all been used as refrigerants in the past. Into this category comes methyl chloride, and some of the hydrocarbons. CFCs (Freons) are non-toxic but some of them have disastrous effects on the ozone layer when released and they are now banned. Sulphur dioxide causes severe respiratory irritation and is toxic. Diethyl ether oxidises and polymerises in the presence of air, creating the interesting compound diethyl ether peroxide (-CH(CH3)OO-)n. This is a colorless oily liquid that is an extremely brisant (fast-exploding) and friction-sensitive explosive; less than 5 milligrams can damage chemical apparatus. The dangerous properties of ether peroxides are the reason that the use of diethyl ether and other peroxide-forming ethers like tetrahydrofuran (THF) or ethylene glycol dimethyl ether (1,2-dimethoxyethane) is carefully avoided in industrial chemical processes. I am certainly not an expert on ether chemistry, but continuously reboiling ether sounds like it might be a good way to generate the peroxide. Peroxides generally have higher boiling points than the compounds they come from, so if an ether mixture is heated, the peroxide can become progressively more concentrated in the boiler and the risk of explosion increases rapidly. Looking at these dire warnings it appears puzzling that anyone was able to operate an ether vapour-compression machine without blowing themselves to Kingdom Come. I suspect the answer is that in a refigerator you can arrange for every part to be under pressure, so air cannot seep in even if there are small leaks, and peroxides cannot form. This is not remotely a comprehensive list. You can find a daunting array of refrigerants in Wikipedia; most of them are only relevant to vapour-compression cycles. Methylene chloride (called carrene in the trade). Bearing in mind all these various hazards, air and water as refrigerants have the attraction of being completely safe. Unfortunately they are also inefficient at refrigerating, and in the case of air its low heat capacity means that large volumes have to be handled. Air must be the ultimate safe refrigerant, (A water-based refrigerator could conceivably drown you) and that is one reason why it is worth looking at. 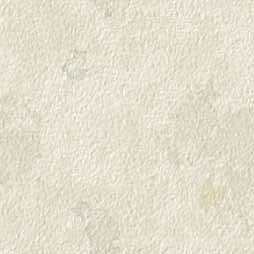 Air has the further advantage that it wil not react with lubricants. However, nothing is wholly risk free. A cold-air machine involves significant pressures, and something might be overstressed and fracture violently. Compressing air carrying a lot of lubricating oil could lead to a Diesel-type explosion. The best-known refrigerating method is the vapour-compression refrigerator. This relies on a refrigerant like ammonia which liquefies easily when compressed and as a result is greatly cooled when passed through a throttling valve. The prolific Ametrican inventor Oliver Evans described a vapour-compression refrigerator in 1805 but appears to have made no attempt to build one. The first vapour-compression refrigerator was patented in 1835 by Jacob Perkins, but not commercially exploited. It used diethyl-ether or "some other volatile liquid" in a closed cycle. 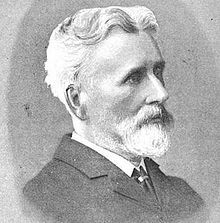 The first commercial use of the vapour-compression refrigerator was achieved by James Harrison, whose first mechanical ice-making machine began operation in 1851 on the banks of the Barwon River at Geelong, in Australia. His first commercial ice-making machine followed in 1854, and his patent for an ether vapor-compression refrigeration system was granted in 1855. It is not possible to make a vapour-compression refrigerator using air because air cannot be liquefied at any reasonable temperature and pressure. (The conditions are quite different in machines specifically dsigned to liquify air) Therefore little or no reduction in temperature occurs on passing compressed air through a throttling valve. Instead work must be removed from the compressed air by making it drive a reciprocating engine or turbine. The use of an expanding engine is not merely a cunning way to reduce the power required to drive the process; it is essential for it to work at all. The work from the engine is used to help drive the compressor, improving the efficiency, but an air refrigerator can never be as efficent as vapour-compression refrigerator; it may not be 1/10 as efficient. Refrigeration engineers prefer to talk in terms of Coefficent Of Performance (COP) rather than efficency because it often comes out as greater than unity, and 'efficencies' of better than 100% have a long and dishonourable association with perpetual-motion nutcases. The passages quoted below are from an article in Engineering for 4th Feb 1881, which was a report on a long and comprehensive paper given by A Mr Lightfoot, an employee of Messrs J & E Hall and Co, of Dartford- who were at the time much engaged in the manufacture of cold air machinery to be used for the importation of frozen meat from Australia, a very important trade. J & E Hall of Dartford was founded in 1785. Cold-air machines had considerable advantages for the frozen meat trade. Suppose you used ammonia instead; a leak could be catastrophic in confined spaces, and if the refrigerant was lost there was no way to replace it and the entire cargo would rot. The latter problem was presumably eased when it became possible to store gases at high pressure in steel cylinders. Dr John Gorrie of Florida in 1851 invented a cold-air machine for ice-making. The hot climate of Florida meant that ice was in much demand, and its distance from ice-exporting countries like Canada made ice expensive. Air was compressed in a cylinder jacketed with water to keep it cool; water injection was also used to reduce the work of compression.. The air then passed through a worm P immersed in a tub of water for further cooling. The air was then expanded in another cylinder C and the resulting cold air used to make ice, after which it exhausted to atmosphere. This open cycle was very inefficient. Gorrie attempted to raise money to manufacture his machine, but this failed in part owing to the death of his partner. He died in relative obscurity (as inventors so often do) at the age of 52. 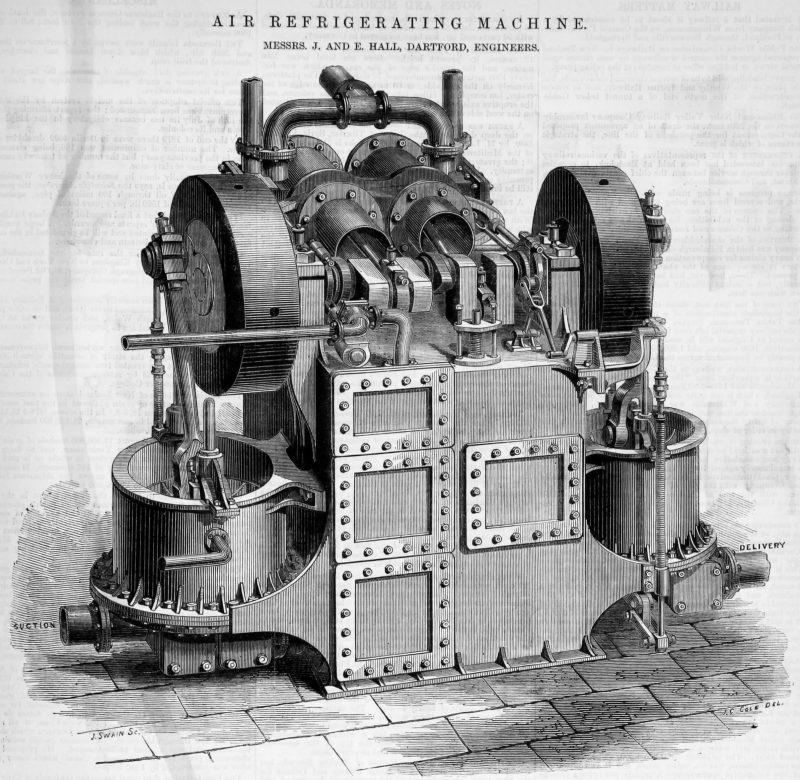 Sir William Siemens was one of the great pioneers of refrigeration, though he did not design a machine himself. 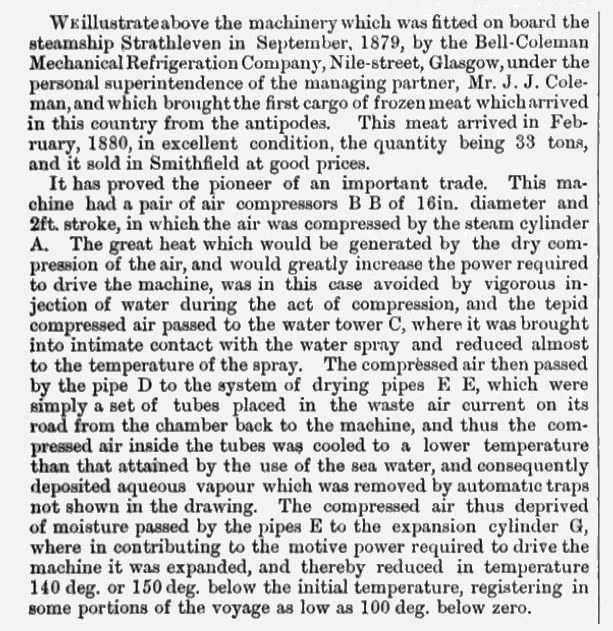 In July 1857 Siemens completed an analysis of Gorrie's cold air machine. He pointed out that Gorrie's machine would more efficient if the exhaust cold air was used to cool the air going into the compression cylinder, and took out provisional patent No 2064. (1857) Siemens is regarded as the inventor of the counter-flow heat exchanger. 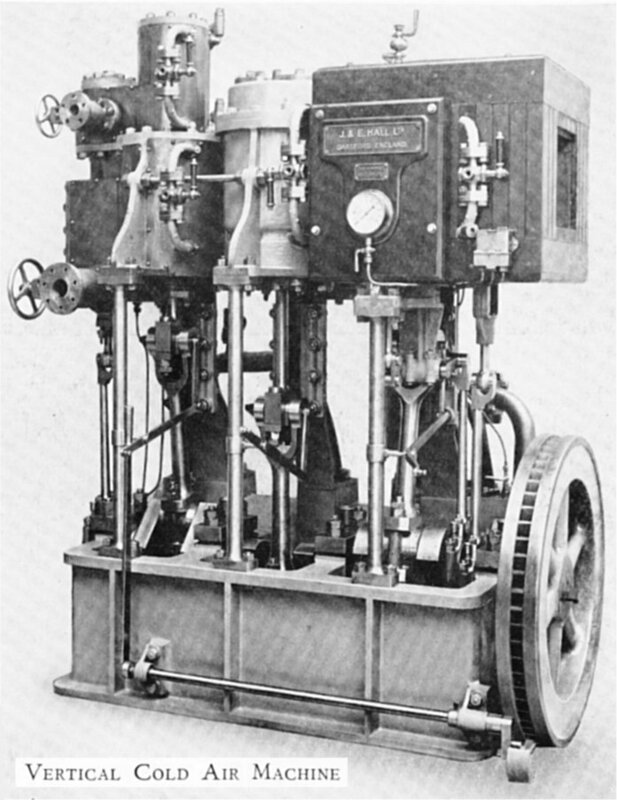 Siemen's second criticism of the Gorrie machine was the presence of a throttling valve before the expansion cylinder; this would have given little or no drop in temperature, but by reducing the air pressure reduced the amount of work that could be removed from the air by the expansion cylinder. Siemen's third criticism related to the problems that would be caused by moisture in the cooled air freezing. "Kirk's machine consists in principle of a single cylinder in which air is compressed at one end and expanded at the other. The beat caused by compression is partially carried off through the cylinder cover, which is water-jacketted, and the cold from expansion is used to abstract heat from a current of brine or other medium, circulating over the cover at the expansion end. Between the two ends is a regenerator, formed of several thicknesses of wire gauze. Through this both the hot compressed air and the cold expanded air pass, on their way from one end of the cylinder to the other; so that there is a continual alternate compression and expansion of the air, and a continual beating and cooling of the regenerator." Note the emphasis on safety. Dr Alexander C Kirk was the engineering manager of a paraffin-oil works at Bathgate, in West Lothian, Scotland; this appears to have been E W Binney & Co, whose dominant partner was James Young Paraffin and other hydrocarbons were extracted from sandstone or distilled from cannel coal (oil shale) in a retort. The owners wanted a method of cooling for paraffin production, presumably to cool the distilled vapour so that the lighter hydrocarbons were not lost. A vapour-compression machine was tried but proved to be a fire hazard. * Given the date, the refrigerant was probably diethyl ether, which would indeed present a serious fire hazard in the event of any leak; not perhaps the best machine to install in a paraffin factory. 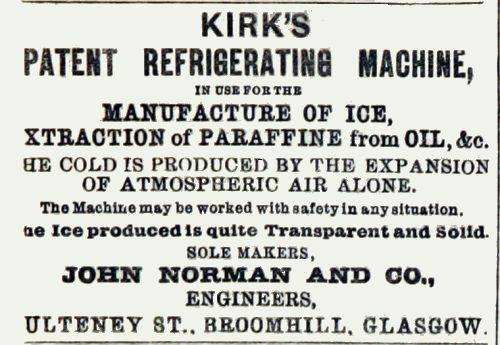 Kirk therefore built a cold-air machine, based on Gorrie's work. 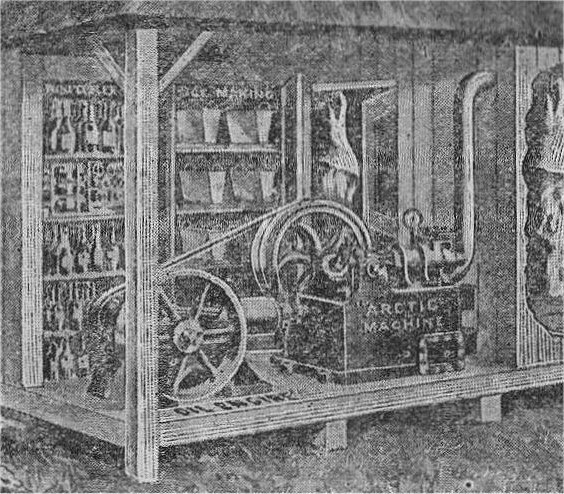 Several similiar machines were built for ice-making, by John Norman and Co. The Stirling hot air engine was developed between 1825 and 1840. 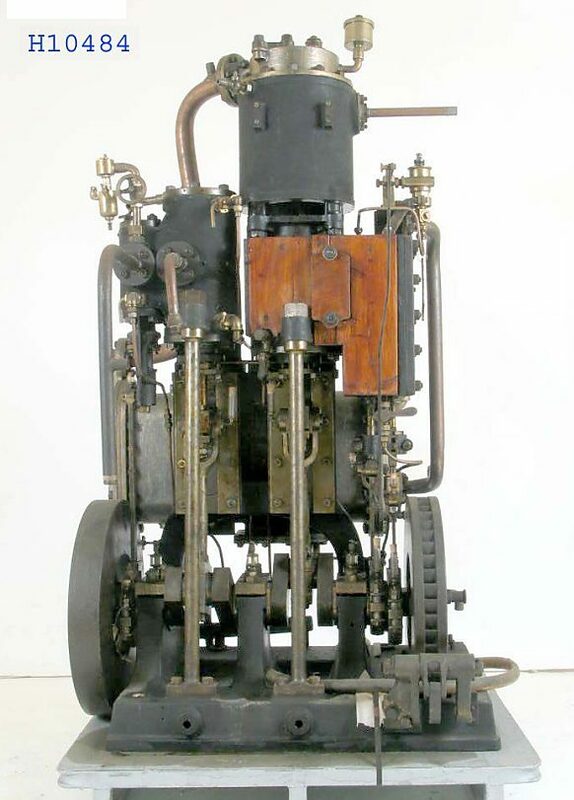 Kirk's machine, introduced in 1861, was the Stirling cycle reversed. Kirk has a Wikipedia page, on which it is suggested that the original refrigerant was indeed diethyl ether. "The Giffard cold air machine consists of one single-acting water-jacketted compression cylinder, and one single-acting expansion cylinder, both worked from cranks on an overhead shaft. The compressed air is led from the cylinder into the air cooler, which is merely a cluster of small tubes placed vertically in a case. The cooling water passes upwards outside the tubes, and thence goes to the compression cylinder jacket; the air is admitted into a casing below the ends of the tubes, passes up through them, and is taken off from the top to a wrought iron reservoir. A pipe from this reservoir supplies the air to the expansion cylinder; the admission and exhaust being controlled by two independent steel mitre valves in the cylinder bottom, worked by cams from the shaft. In this machine no attempt is made at drying the air; all the moisture taken into the compression cylinder is discharged in the form of snow from the expansion cylinder, with the exception of the portion deposited in the air cooler owing to the partial cooling of the compressed air." This cold�air machine was patented in France by Paul Giffard in 1873; do not confuse him with his older brother Henri Giffard, the inventor of the injector and the first to build a powered and steerable airship. Paul Giffard is best known for his work on gas-powered guns. Here the compression and expansion cylinders are mounted in the base of the nachine, each side of the flywheel. The vertical tank with a pressure gauge on top is presumably the air cooler as it has a small diameter pipe suitable for cooling water running into it. The function of the tank at the right is unknown; it appears to have a safety valve mounted on it. This does not look very different from the 1873 model. A must be the compression cylinder because it has spring-loaded self-acting valves. B is the expansion cylinder and requires valves driven from the crankshaft to operate. C is the heat exchanger which cools the air before it goes to the expansion cylinder. These magnificent engravings show two different models of cold-air machine. The top machine has two squat vertical cylinders that constitute the cold-air machine. This is powered by a horizontal steam-engine that for some reason is cantilevered up in the air. The valvegear is just underneath the insulated steam cylinder; it is driven by a big eccentric on the nearer end of the crankshaft, via a rocking arm. Next to the eccentric a small crank drives a water-pump. It is probable that the compressor cylinder of the cold-air machine is the nearer of the two, because it appears to have a water-jacket to reduce the heating of the air and so improve the efficiency of compression. The air cooler is under the bolted cover at the right. The bottom machine appears to have no steam engine integrated with it, possibly being driven by the shaft at left. The squat cylinder in the centre is probably the compressor cylinder, as it appears to have a water-jacket to improve the efficiency of compression. 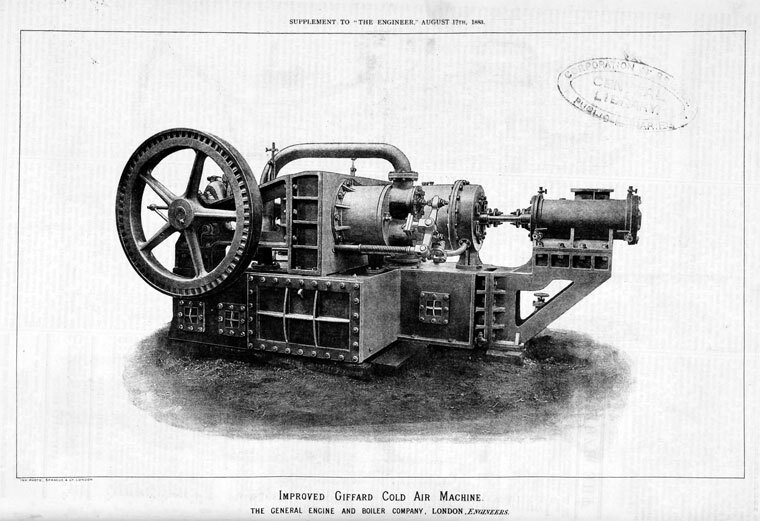 This is another 'Improved Giffard' cold-air machine manufactured by the General Engine & Boiler Company. Three cylinders are visible here; the one on the left has valvegear driven from the crankshaft and so must be the expansion cylinder; underneath it is the air cooler chest. The central cylinder appears to have automatic air inlet valves on the cylinder head, so this must be the compression cylinder. The cylinder at far right might be the steam cylinder that powers the machine, but it looks rather small for the job and shows no sign of insulation. From Supplement to The Engineer for 17 August 1883. "Windhausen's machine expands air from its ordinary atmospheric pressure under a piston; the cooled and expanded air being discharged much below the atmospheric pressure, either through tubes surrounded externally by brine, or into a hermetically sealed chamber, where the objects to be frozen are placed. After this process the air is again compressed to atmospheric pressure, cooled, and re-expanded. The disadvantages of this machine are the large size of the cylinders, &c, necessitated by the very low pressure employed, and the fact of its entirely depending for its action on the production of a partial vacuum." By Franz Windhausen of Brunswick. He took out US patent 236,471 for an ice-making machine in 1881, that worked by evaporating water in a vacuum. "Sturgeon's refrigerator is a horizontal machine with some novel arrangements as regards the construction of its air-valves and pistons. The compressed air is first cooled partially by being passed through tubes sunounded by cooling water, an then passed through charcoal or some other absorbent of moisture, before being admitted to the expansion cylinder. If the charcoal or other material is properly changed and renewed when necessary, this may form a dry air process; but, as already stated, the introduction of a chemical drier is in the author's opinion undesirable, except under special conditions." Sturgeon and his refrigerator may have been known to Mr Lightfoot but they are unknown to Google. No illustration of the machine has so far been found. Left: Advert for cold-air machine: 18?? 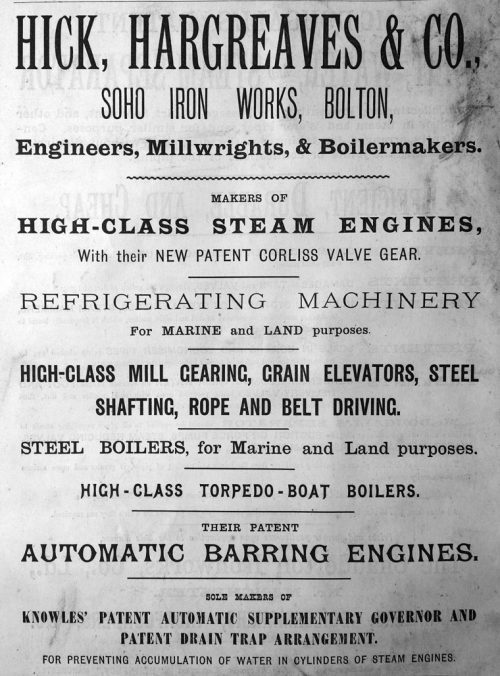 "Messrs. Hick, Hargraves, and Co, of Bolton, manufacture cold air machines of horizontal form, in which the Corliss cut-off gear is applied to the admission valves of the expansion cylinder. The air is compressed in a double-acting cylinder, into which cooling water is injected at each stroke; it then passes through a series of receivers, in which the water mechanically carried over is deposited, and is finally admitted to the expansion cylinder, and expanded to atmospheric pressure. So far as the author knows, no attempt is made at drying the air, which passes to the expansion cylinder fully saturated for its temperature and pressure; but a large snow-box, consisting of a series of baffles, abstracts the bulk of the snow from the cooled air, after expansion and before its introduction to the chamber. In a machine of this description which the author has seen, the snow had to be cleared out from the exhaust valves every few hours." So far attempts to find out more about the refrigeration activities of Hick, Hargraves & Co have met with very little success. 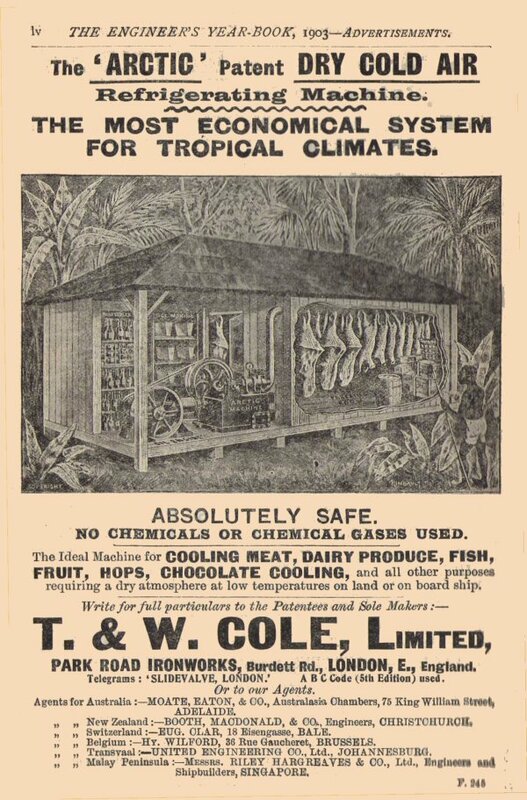 This advertisement confirms that they were in the refrigeration business, but that's about it so far. Messrs J & E Hall and Co were the employers of Mr Lightfoot, who wrote the comments in quote marks on this page. He later branched out on his own. Left: A J & E Hall cold-air machine: 18?? Nothing specific is known about this daunting lump of machinery, but some things may be deduced. The cylinder on the far left is the compression cylinder, because it is of larger diameter than the other (expansion)cylinder. The pipe running into it labelled 'suction' confirms this. 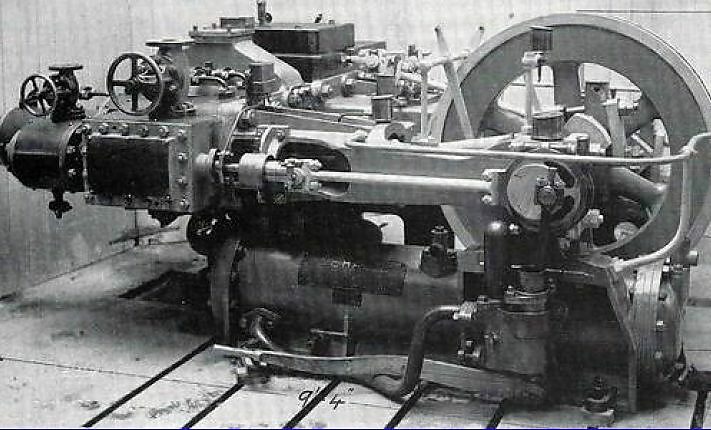 The cylinder on the far right is the expansion cylinder; not only is the pipe coming from it labelled 'delivery' but its mechanically-operated valve-gear can be seen just in front of it, operated by a cam on the crankshaft. The chest between the two cylinders is the air cooler; a small pipe for cooling water can be seen going into the top of it. The bolted access plates are to allow cleaning of the pipes in the cooler. The two small horizontal cylinders above the cooling chest are the steam engine that drives the machine. Note the two cranks are set at 90 degrees to avoid dead-centre problems. Left: A J&E Hall cold-air machine: 18?? C is the air compression cylinder. E is the smaller air expansion cylinder, with the steam power cylinder on the same piston-rod.. This photograph clearly shows a different and later design compared with the two just above. The horizontal cylinders nearest the viewer appear to be a tandem compound steam engine. The furthest cylinder appears to be insulated and is therefore probably the expansion cylinder. The stubby vertical cylinder just below the valve eccentric is probably the water pump, judging by the air vessel next to it. The cylinder that forms the base of the machine is the air cooler. The 9 feet 4 inches written on the photograph appears to be the overall length of the machine. Left: A J&E Hall horizontal cold-air machine: date? This is clearly a different design of machine from that shown just above, having two rectangular air coolers, rather than one cylindrical one, built into the base. Image from the book J & E Hall by Everard Hesketh (1935) which gives a history of the firm. It is likely that this machine was considerably earlier than 1935. It's nice to have the history, but it is woefully short on technical detail. This vertical cold-air machine takes up a lot less floor-space. Here we have to the left a tandem compound steam engine. In the middle is the compression cylinder, confirmed by the fact it has no valvegear. The protrusions on the top of this cylinder are probably the automatic air intake valves. At right is the insulated expansion cylinder. But where is the air cooler? There doesn't appear to be room to build it into the base of the machine. Perhaps it was a separate assembly. In 1887 the firm entered into arrangements with Franz Windhausen (whom we have met before) to manufacture and develop his CO2 refrigerating machine. By 1927 Hall were exploring getting into the market for small refrigerating machines using methyl chloride as a refrigerant. I am glad to report they are still around today. They still make CO2 machines. Image from the book J & E Hall by Everard Hesketh 1935. This Haslam cold air machine was designed to produce 2000 cubic feet (57,000 litres) of cold air per hour. 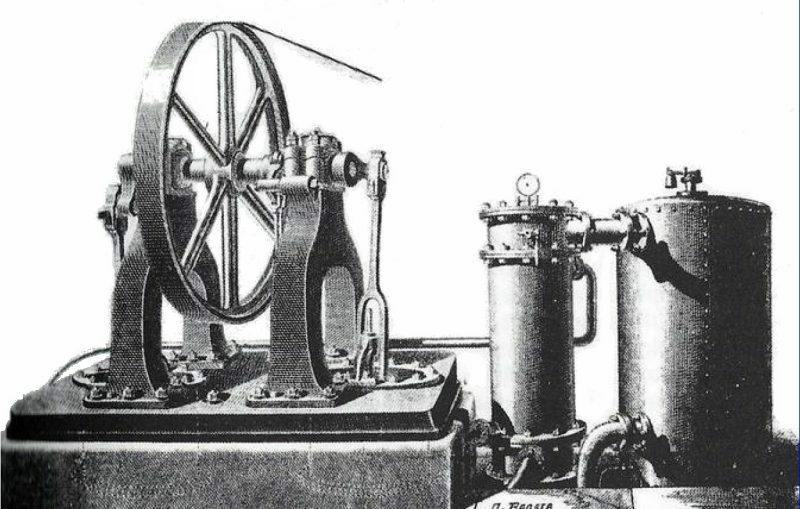 On the left is a vertical single-cylinder double-acting steam engine. An eccentric on the crankshaft actuates the steam slide valve. The air cylinders are at the right, with the compression cylinder mounted above the expansion cylinder; their pistons are attached to a common piston rod. The compression cylinder has connections for its water jacket. There must also be somewhere a heat exchanger, and water pump. I suspect the heat exchanger is the grey rectangular box behind the connecting rods. Air at atmospheric pressure is drawn into the compression cylinder through an intake valve. As it is compressed, its temperature rises. The hot compressed air then passes to the water-cooled heat exchanger. The cooled air is admitted to the expansion cylinder through mechanically-operated expansion and cut-off valves, operated by the two eccentrics at the right end of the crankshaft. As the piston rises, the cut-off valve stops the admission of compressed air to the cylinder, which reduces the pressure, and thus the temperature, of the air as it does work. Later, near top dead centre, the expansion valve opens and, on the downward stroke of the piston, the cold air is expelled. The temperature of the delivered air is controlled by the timing of the opening of the cut-off valve. The cycle theoretically follows the reversed Brayton cycle, comprising isentropic compression, constant pressure cooling, isentropic expansion and, finally, constant pressure discharge to either refrigerant coils or discharge into a cold room. An isentropic process is a reversible adiabatic process, in other words a reversible process having no heat exchange with the working fluid. All three cylinders have 250 mm stroke. Cylinder bores are: steam 120 mm, compression 235 mm, expansion 155 mm. The expansion cylinder has wood lagging (the orange material in the photo) over a straw-like insulating material. There is a flywheel at each end of the crankshaft. This example was made 1882. This machine is at the Museum of Applied Arts & Sciences in Sydney, Australia, where it is Exhibit H10484. It is not immediately obvious why this machine was built on an incline. The air cooler is presumably behind the flanged access plate, but beyond that it's pretty much impossible to work out what's what in this pile of machinery. 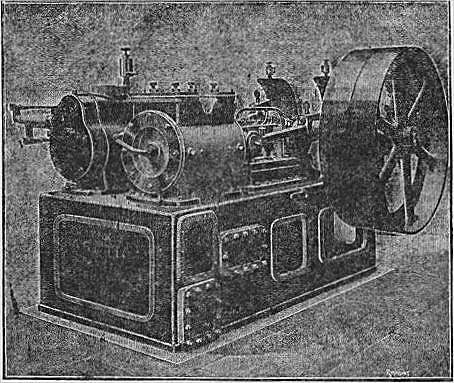 Note the rocking beam driven from the crankshaft, which appears to be connected to a water pump and a Mysterious Cylinder. This Haslam machine has a more conventional horizontal layout. The compression cylinder is presumably the large one to the left, as it is fitted with spring-loaded inlet valves. 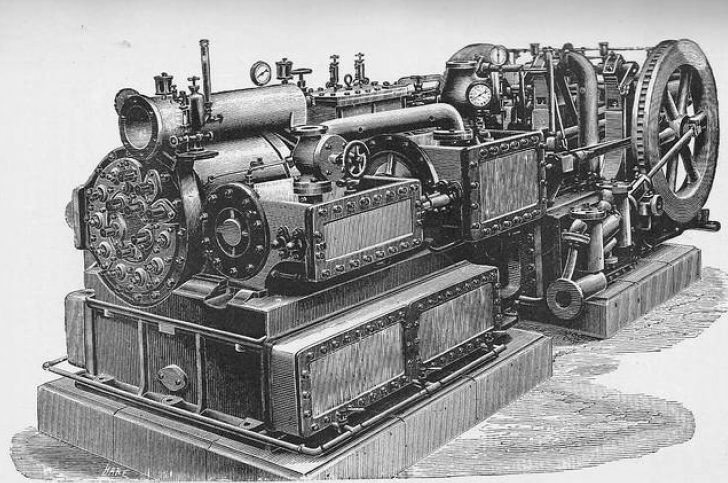 The two cylinders in the foreground are presumably the expansion and steam cylinders, as both appear to have valvegear driven from the crankshaft. The air cooler is the rectangular box that forms part of the base of the machine. Another cold-air machine in the vertical style. Bell and Coleman were one of the leading suppliers of air refrigrators. "The Bell-Coleman refrigerator consists of an ordinary machine for producing cold air by compression, cooling, and expansion, combined with an apparatus for depositing a portion of the moisture before the air is admitted to the expansion cylinder. In this system the air is partially cooled during compression by the actual injection of cooling water into the compressor, and by causing the current of compressed air flowing from the pumps to come in contact with a spray of water. From the pumps the mixed air and water is led by pipes into a chamber or chambers with perforated diaphragms, which catch a portion of the suspended moisture. The air, still in its compressed state, and cooled to within 5 or 10 degrees of the initial temperature of the cooling water, is then led to the expansion cylinder through a range of pipes, or other apparatus, with extended metallic surfaces, cooled externally to a lower temperature than that of the cooling water; so as to induce a further reduction in temperature and consequent deposition of moisture. This extra cooling of the compressed air is effected either by allowing the cold expanded air, before it reaches the chamber to be cooled, to come in contact with the range of pipes, or by exposing these pipes to the spent air passing from the cold chamber. The author then considered at considerable length the objections to which the machine was open. It should howwever, be stated that he very frankly added that these machines have been successfully worked in cases where a large amount of cooling water of low temperature is available, as, for instance, on board an ordinary Atlantic steamer. There is no doubt that moderately dry air would be obtained wherever a sufficient supply of water at 46 deg. or 50 degF can be had." Air at atmospheric pressure is drawn into the compression cylinder through an automatic intake valve. As it is compressed, its temperature rises. The hot compressed air then passes to a water-cooled heat exchanger. The cooled air is admitted to the expansion cylinder through mechanically-operated expansion and cut-off valves, operated by the two eccentrics at the right end of the crankshaft. As the piston rises, the cut-off valve stops the admission of compressed air to the cylinder, which reduces the pressure, and thus the temperature, of the air as it does work. Subsequently, near top dead centre, the expansion valve opens and, on the downward stroke of the piston, the cold air is expelled. The unlagged cylinder on the left is the compression cylinder, because it does not have mechanically-operated valve driven from the crankshaft. 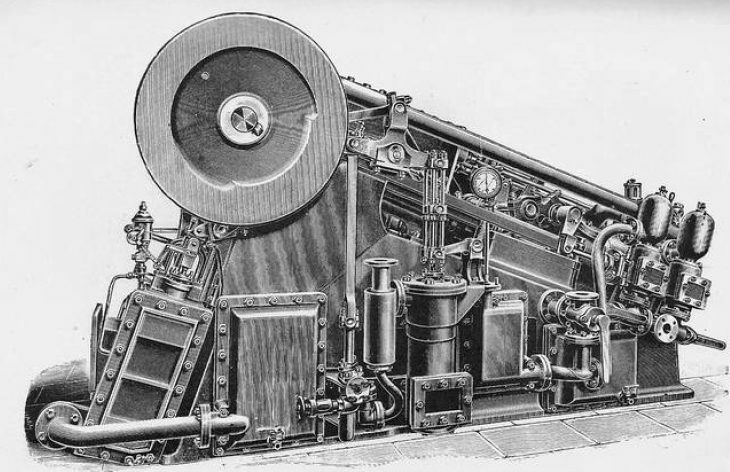 The lagged cylinder in the middle does have such valves, and so is either the steam power cylinder or the expansion cylinder; whichever it is the other cylinder is behind it, and connected to the crank on the far side of the crankshaft. The expansion cylinder was always smaller than the compression cylinder, because it was handling colder air. The original source of this magnificent image is Engineering for 28th Oct 1881, p314. The first Bell-Coleman machine was used on the SS Strathleven, which brought the first successful cargo of frozen meat from Australia to London, arriving in February 1880. 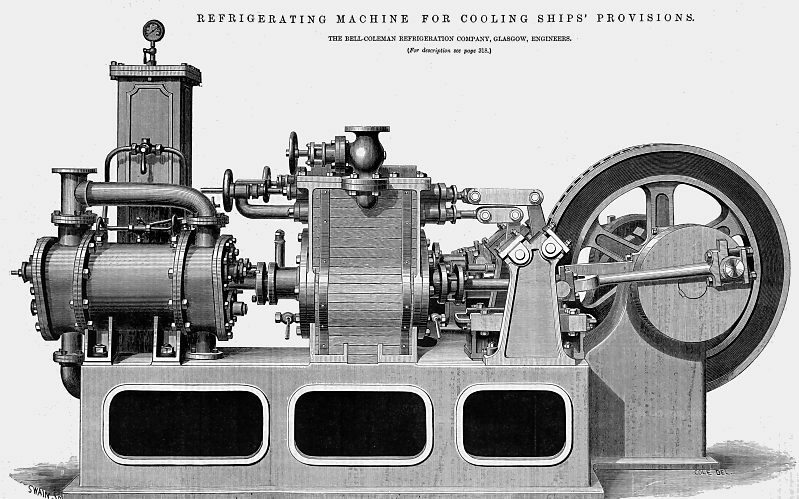 The machine illustrated above is described as "a new type of machine of small dimensions for the cooling of ships' provisions" rather than freezing the whole cargo. Important refinements were the use of water injection into the compression cylinder, to cool the air and reduce the work required for compression, and the cooling of the compressed air by the return air from the refrigerated space. At this point the water was condensed from the moist air and removed by automatic trap valves. The dry compressed air then passed to the expansion cylinder G.
This was a closed cycle with the return air going back to the compressor cylinders via pipe K.
The lower diagram shows a later installation on the P&O steamships Rome and Carthage. From Engineering for 28th Oct 1881, p318. Note that the artist has omitted both connecting rods from the Strathleven machine. This extract from the 1881 Engineering article gives details of the original Bell-Coleman machine in the Strathleven. See diagram above. Left: Bell-Coleman air refrigeration machine: 18?? The air cooler is built into the base of the machine. 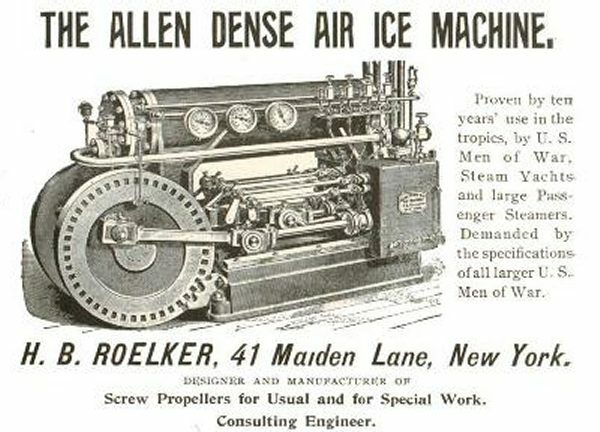 The splendidly-named Allen Dense Air Machine was a relatively late entry into the air refigeration market. Little is known about its operating parameter; I can only assume that 'Dense Air' refers to working at higher air pressures than usual to make the machinery more compact. 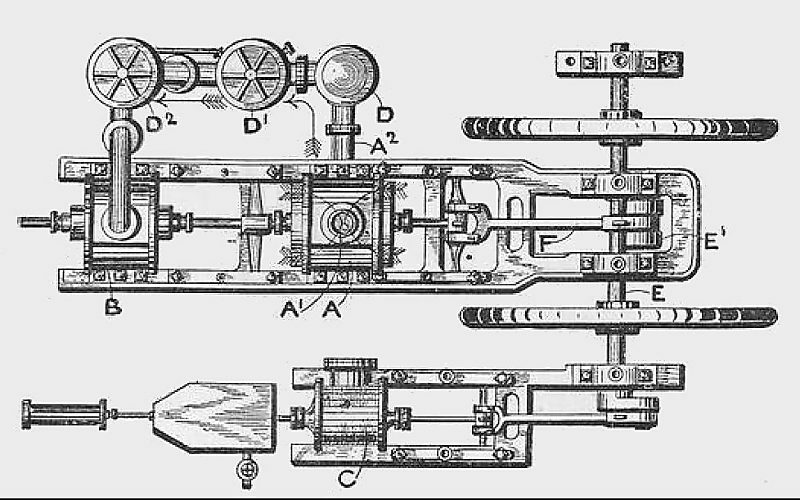 While this diagram looks complicated, it has the same basic components as the other machines; a steam engine to drive it, an air compression cylinder, and a smaller air expansion cylinder which helps with the driving. There are also small pumping cylinders for cooling water and make-up air. Diagram from Audells Plumbers and Steam-Fitters Guide, Volume 3, p2342. Pub 1949, reprinted 1953. I bought my copy in Vancouver in September 2007. That's an impressive list of steam-yachts. Note the emphasis on avoiding chemicals by using air as the refrigerant. As we have seen above, Mr Lightfoot- full name Thomas Bell Lightfoot- was an employee of Messrs J & E Hall and Co, of Dartford in 1881, when he made the comments reported above. He was only with them for a short time; he then branched out on his own, working in London as a Consulting Engineer. At this time he designed and patented his own Dry Air Refrigerating Machine. A public company incorporated as Linde British Refrigeration Co had been formed in 1885, and in 1890 the company appointed Lightfoot as its Managing Director. The name was changed to Lightfoot Refrigeration Company in 1916. In 1922 the company still had its head office in Victoria Street, London. This cold-air machine looks very much like the others in this gallery, and it is not currently known what was novel and therefore patentable about it. There are the usual compression and expansion cylinders, driven by a steam cylinder alongside. The air coolers are the two circular items in the base. The only curious features are that the expansion cylinder looks to be the same size as the compression cylinder, while in all the other machines it is smaller. The compression cylinder appears to have mechanically-operated inlet and outlet valves of the Corliss type, unlike the usual automatic spring-loaded valves; perhaps this reduced losses. T & W Cole Ltd manufactured the 'Arctic' air refigerating system. Information on this company has proved very hard to find. Not much can be deduced from this poor-quality image, but looks as if the air cooler was built into the baseplate, as with other machines on this page. 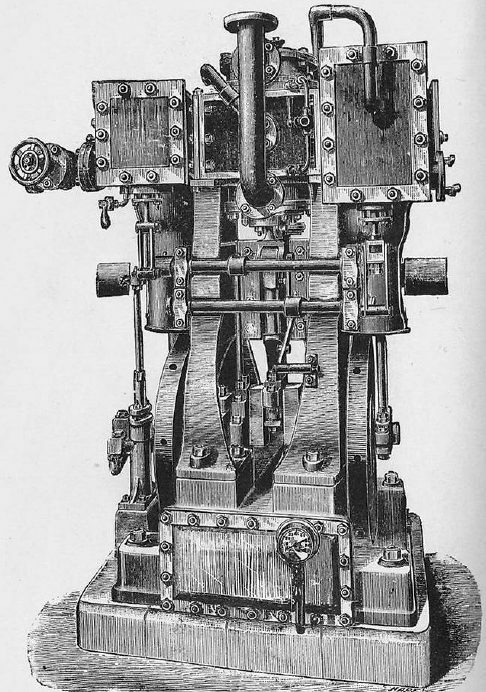 According to The Manufacture of Chocolate: and other cacao preparations by Paul Zipperer (3rd edition 1915) the Cole machines compressed air to 70 or 80 atmospheres. (1028psi to 1176psi) This is far too high and presumably 70 - 80psi was meant, bring it into line with other air refrigerating machines. T & W Cole were based at Park Road Iron Works, London, E. Attempts to find this address were hampered by the fact that other sources say it was actually in Saint Annes Road, near Burdett Road, East London. Saint Annes Road runs north-south through the centre of the map, crossing Park Road which runs east-west. The Regents Canal is just off the map to the left. Almost all the buildings in Saint Annes Road are shown as residential, in the standard London 'front plus back extension' format, which means two or three bedrooms. It is puzzling that there appears to be no site large enough to hold a factory. 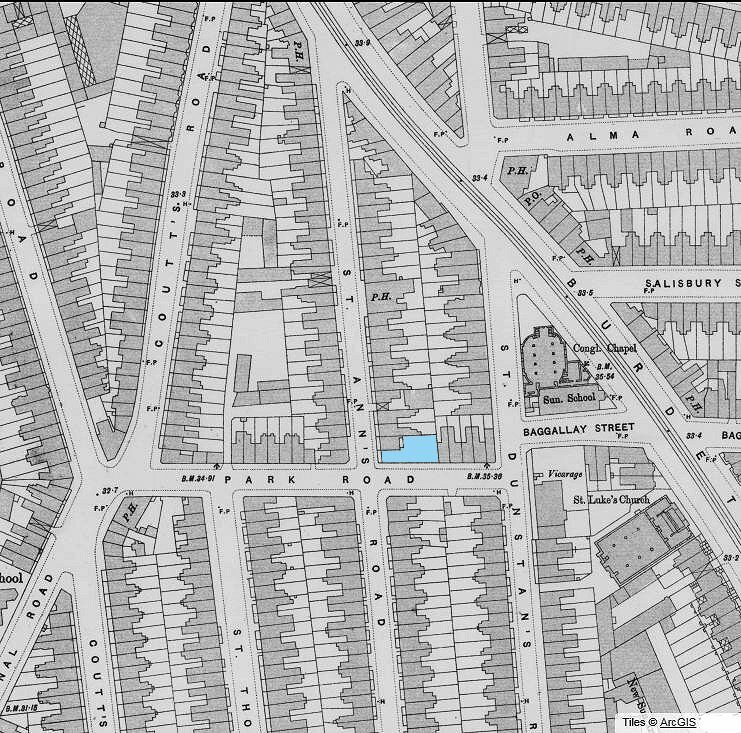 The only real possibility is the building of the north-east corner of the intersection of Park Road and Saint Annes Road, (coloured blue) which would account for the two different locations given. However this only has three times the plan area of a three bedroom house, which really doesn't seem big enough. This area was heavily bombed in WW2 and much of it to the west of Burdett Road has been made into a park. All of these streets have disappeared except Burdett Road. In case you're wondering why I thought this worth looking up, it is because for a while I lived on Burdett Road. The absence of chemicals and chemical gases (presumably ammonia or sulphur dioxide) is used as a major selling point. 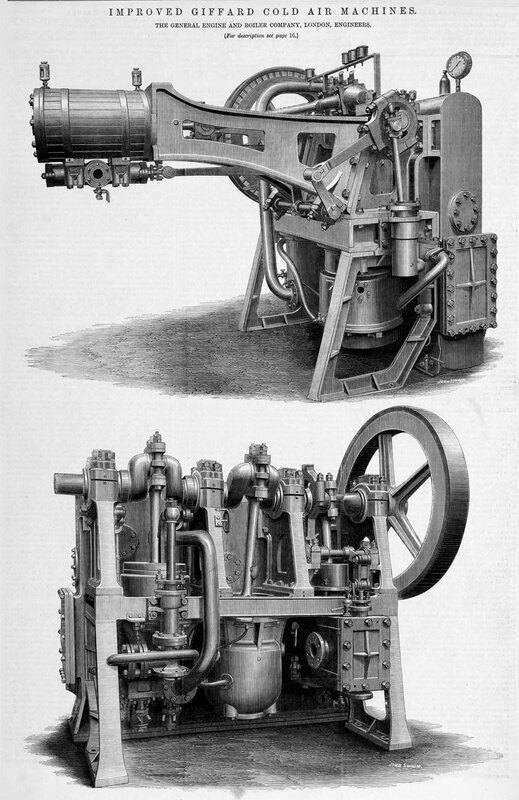 Zooming in on the picture above shows an Arctic Machine being driven by a horizontal oil-engine. The machine is cooling wine and making ice, as well as cooling sides of beef. This does not look like the same design of machine as that at the start of this section. Here is an extremely useful table comparing the Haslam, the Bell-Coleman, and the Cole refrigerating systems. We learn that the Cole system was built in at least two different sizes. Note that the manufacturers agree that 61 to 75 psi is an appropriate air pressure. The proportion of the compression power returned in the expansion cylinder is from 47 to 51%, in remarkable agreement. It is clear that the expansion cylinder was no mere optional extra but cut energy consumption in half. 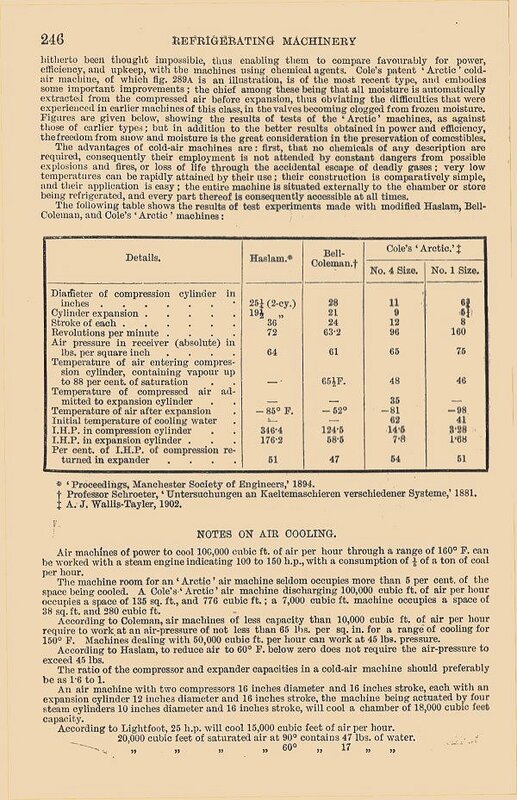 'NOTES ON AIR COOLING' also provides some useful information. A public company incorporated as Linde British Refrigeration Co was formed in 1885, and in 1890 the company appointed Lightfoot as its Managing Director. The name was changed to Lightfoot Refrigeration Company in 1916. In 1922 the company still had its head office in Victoria Street, London. Duplex implies two cold-air refrigerators, apparently driven by a shared compound steam engine. On the nearer side there three cylinders in tandem, with only the outer two wooden-cased. The two to the right both have mechanically operated inlet and outlet valves of the Corliss type, as does the Lightfoot machine just above. Since the middle cylinder is unlagged it is probably the compression cylinder. The leftmost cylinder has what appears to be a conventional valve-chest on its far side and is probably one of two compound steam cylinders; from its size the high-pressure one. On the other side of the machine the leftmost lagged cylinder with the rectangular box on the side is very likely the low-pressure steam cylinder. 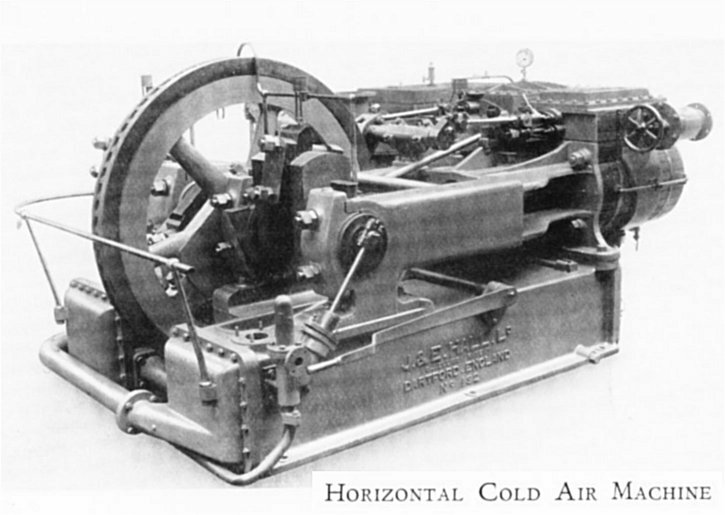 Cold-air machines were largely displaced by ammonia machines during the 1880's.